A Living Wreath With Plenty Of Wow! This living wreath Jamie planted the other day has plenty of WOW factor, doesn’t it? She incorporated a very cool bromeliad plant, Cryptanthus ‘Black Mystic’, and an annual trailing foliage plant used a lot in sunny containers – silver dichondra. 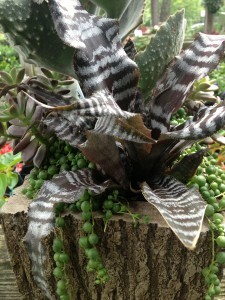 The round, silvery foliage of the dichondra “echoes” the lighter markings in the cryptanthus beautifully. A third plant in this mix is streptocarpella, an open growing plant with airy blue flowers. 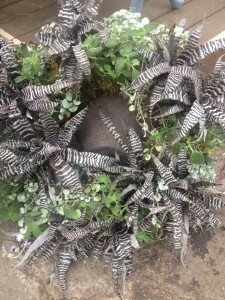 The wreath is made using a two piece metal form that is lined with green sheet moss and filled with a good, light potting soil. We use Fafard – a good soilless mix containing NO fertilizer or moisture holding products. Once all the plants are inserted into holes poked through the moss, additional moss is used to firm the plants in and the wreath is watered well to settle the soil. It’s been hanging in our bright greenhouse for a few weeks now and is settling in nicely! The cryptanthus also plays well with succulents – the foliage form is such a nice contrast with the roundness of other plants. You can see an example of this in the photo here…even there it has a bit of that “wow” factor! We’ve gotten in more of these wreath forms if you’d like to try your hand at them, and we have more of the cryptanthus if you’d like one for yourself. They are really eye catching and so easy to care for. We’ll show you in more detail how to make one of these wreaths in a later post – or, if you’re in the area, let us know if you’d like us to make one for you! This entry was posted in Arrangements, Planting Tips, Project, Succulents, Uncategorized and tagged cryptanthus, how to plant a living wreath, living wreaths, silver dichondra, succulents in wreaths on June 24, 2013 by Kris Blevons.